Granatelli 3 Inch Electric Exhaust Cutout Kit Granatelli 3.0 Inch Electric Exhaust Cutout Kit, Granatelli 307530K Electric Cutout Kit, 3 Inch Electric Exhaust Cutout Kit, 3 Inch Exhaust Cutout Kit, Electric Exhaust Cutout Kit, Exhaust Cutout Kit, [Granatelli 307530K Cutout Kit] - $339.95 : 3rd Strike Performance, Your Source for Late Model MOPAR Performance Parts and Accessories! Granatelli Motor Sports electronic exhaust cutout dual systems feature smart chip controlled motors for one-touch rocker switch operation. There is no need to hold the switch to completely open or close the cutout … eliminating the most common cause of damage to the internal gears. 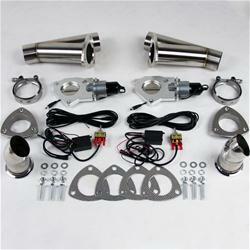 Exhaust Cutout, Electric, Aluminum, Clamp-On, 3.0 in. Diameter, Stainless Steel Tubing, Kit, Includes mounting hardware, gaskets and proper wiring harnesses.